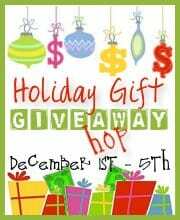 As part of the upcoming Holiday Gift Giveaway Hop, I'm looking for sponsors that would like to participate. The event runs December 1 to 5th and there over 200 blogs participating so far. This exposure will generate a lot of hits to your business and will be fun for everyone involved! The giveaway theme is cash and gift cards/gift certificates and I'm looking for businesses who would like to sponsor my blog with a gift certificate to their business. This can be US or international the choice is yours. One of our organizers, Simply Stacie is expecting this to be a high traffic event and the buzz is already building online about it. I am offering a tier level of sponsorship packages that you can choose from. A Company or Product Feature Post - This 300+ word post will include two keyword links of your choice to include pictures. A Sidebar Button Ad - I will provide a sidebar button ad for the month of November up until December 15. A Facebook Post - I will provide a Facebook post on your business and will suggest your page to my followers. Weekly Tweets - I will send weekly Tweets out to my 1700+ Twitter followers about your company and a link to your site starting November 1 to December 5. Description of your business - I will provide a link to your site and a picture on the Holiday Gift Giveaway Hop post. Four Tweets - I will send weekly Tweets out to my 1700+ Twitter followers about your company and a link to your site starting November 1 to December 5. Tweet - I will send a Tweet out to my 1700+ Twitter followers about your company and a link to your site starting November 1 to December 5. If interested, please send an e-mail to staying_younger@yahoo.com or if you have any questions.